The first Mayor of Hedon took office in 1348. He and two bailiffs were responsible for law and order within the borough boundaries. The Corporation collected harbour duties on goods entering and leaving the port, and the Mayor's officers ensured that town rents and tolls from visitors arriving for weekly markets were paid into the borough treasury. In mediaeval times the Mayor was protected by his Sergeant-at-Mace. The normal weapon of the day was a mace and the Mayor's sergeant would carry one to defend the Mayor when he was about his duties. To make the authority of the Mayor obvious to everyone his mace became more and more elaborate and identifiable. The shaft and mace head were clad in silver, yet the mace still remained an effective weapon. Hedon is the proud owner of the oldest civic mace in the country. 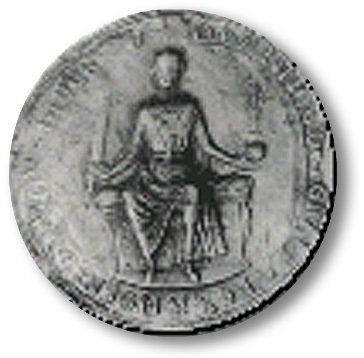 Henry V granted an important charter to Hedon in 1415 and the Borough acquired the mace at the same time. It is believed that John Alured, who was elected Member of Parliament for Hedon in 1640, started the tradition by presenting a silver wine bowl to the corporation to mark the occasion. Several others continued this tradition and now Hedon has a small but important collection of silver. At intervals throughout the year the Mayor in office holds "Silver Shows" and anyone who is interested in seeing the Town Silver should contact the Town Clerk who will put their name on the waiting list.